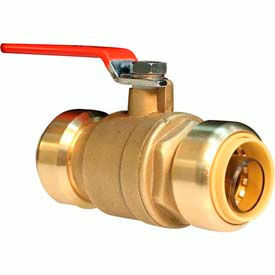 Lead Free Brass Push-In Full Port Ball Valves Are Used For All Plumbing Applications. Ball Valves are made of Lead Free Brass with brass color finish for long lasting durability. Easy to install. No clamping, crimping, gluing or soldering. Permanent leak-free connection. Available lengths are 3", 3-5/16" and 4-1/32". . Sizes vary. 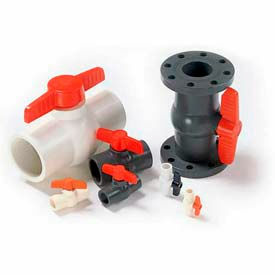 SharkBite Valves Are Used For Applications Including Plumbing, Residential, Commercial And More. 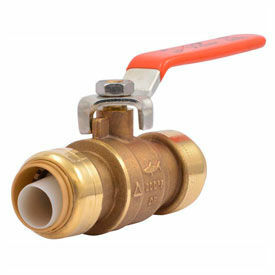 SharkBite valves are made of brass and stainless steel for long lasting durability and corrosion resistance. Valves provide cost effective water flow control. Single lever control allows convenient operation and is suitable for potable water and hydronic applications with a required shut-off. Fittings accommodate crimp ring or clamp connection methods. Connection type is Push-Fit. Package quantities are 6 and 12. Meets UPC, IPC, and cUPC requirements. Dimensions vary per model. 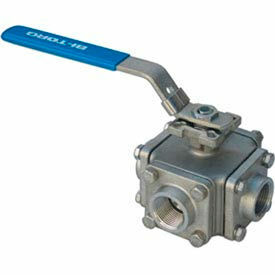 T316 Stainless Steel Two-Way & Three-Way Ball Valves Are Used For High Pressure Applications. Apache™ Polypropylene Ball Valves Are Used For Fluid Handling Operations. Manufactured from stainless steel, they are used for corrosive environments such as chemical plants and refineries. The full flow design assures maximum operating efficiency. The reinforced RPTFE seats and seals, coupled with the Stainless Ball and blow-out proof stem, result in the utmost reliability. 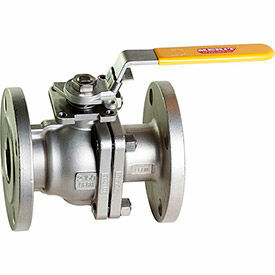 Gas Ball Valves Are Used For Gas Piping Systems That Require Easy Access To Valve Switch. Gas ball valves feature a forged brass body to help eliminate pinhole leaks commonly associated with cast products. The specially designed seat rings assure longer life. The simple quarter turn design allows for easy operation. To ensure safe reliable performance all Gas Ball Valves have a blow-out proof stem with double o-rings that has been 100% leak tested. Temperature range is -40° to 150°F. Available as Gas Ball Valve Straight 1/2" F.I.P. x 1/2" F.I.P. and Gas Ball Valve Straight 1/2" O.D. Tube x 1/2" F.I.P..
American Valve Ball Valves Are Used For A Wide Variety Of Agricultural, Irrigation, Chemical Plant, Factory And Other Commercial And Industrial Liquid Or Water Supply And Waste Applications. 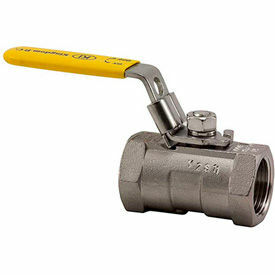 American Valve Ball Valves are made of durable Steel, Brass, Bronze, Cast Iron, Ductile Iron, PP, PVDF, PVC or CPVC construction for long lasting use and dependability. Wide variety of Ball, Flanged Ball, Gas Ball, Single Union Ball or True Union Ball type valves are available in various connection styles and pipe sizes to meet particular need or application. Connection styles include Compression, Flanged, CTS, Pex, Socket, Sweat, Threaded, Viperlok and Threaded & Socket Union. Ball valves use a spherical disc to control the flow between pipes, tubes, or hoses. Flow is allowed when the hole that pierces the ball-shaped disc is in line with the inlet and outlet of the valve. Flow is blocked when the ball is horizontally swiveled 90 degrees, so that the hole of the ball is perpendicular to the opening of the valve. Ball valves can be referred to as full port or reduced port (also known as regular or standard port) depending on the inner diameter of the valve. 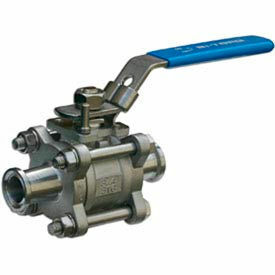 A ball valve is full port if the hole of the ball is the same size as the inner diameter of the connecting pipeline (resulting in lower friction) and is reduced port if the hole of the valve is one pipe size smaller than the pipe, resulting in less flow through the valve than through the shaft of the pipe. 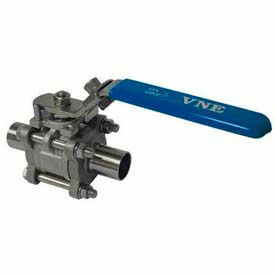 Ball valves may have a handle or lever that aligns with the ball's position (open or closed) for manual operation. They are primarily used in air, gas, liquid, and steam applications. BI-TORQ® 2-Piece Manual SS NPT Ball Valves Have A Maximum Steam Temperature Of 366°F. BI-TORQ® 2-Piece Manual SS NPT Ball Valves have spring loaded belleville washers and blowout proof stems. RTFE® seats and TFE® seals allow these stainless steel valves to be compatible with a wide range of industries and media types. Though manual, these models come with both a lockable lever handle and an ISO mounting pad for direct mount actuation. The valve has a pressure rating to 1000 PSI and a temperature rating to 450°F. Models range in size from 1/4" to 3", have adjustable stem packing, and feature NPT (threaded) ends. BI-TORQ® Actuators can be mounted onto Manual SS NPT Ball Valves. BI-TORQ® 3-Piece Manually Operated SS Sanitary Clamp End Ball Valves Have A Steam Temperature Rating To 366°F. BI-TORQ® 3-Piece Manually Operated SS Sanitary Clamp Ball Valves are used for the food industry, pharmaceutical, and other applications that require high purity valves. This stainless steel model features sanitary clamp ends. 3-Piece design allows for easy maintenance and cleaning without removing the clamp end pieces from the pipeline. Cavity filler TFE® seats and TFE® seals prevent product entrapment. The valve has a pressure rating to 1000 PSI and a temperature rating from -40°F to 450°F. Models have 240 grit bore polish and range in size from 1/2" to 4". They also come complete with an ISO mounting pad (for direct mount actuation) and a lockable lever handle for manual use. BI-TORQ® 3-Way Manually Operated L-Port SS NPT Threaded Ball Valves Are Used For High-Cycle Applications. This BI-TORQ® 3-Way SS Ball Valve features NPT (threaded) ends and an L-Port configuration. 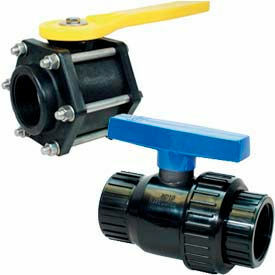 It has a full port, heavy duty construction, multi-port ball valve with a 4-seat design. RTFE® seats and TFE® seals ensure these stainless steel valves are compatible with a wide range of industries and media types. Valves have a pressure rating to 1000 PSI and a temperature rating to 400°F. Models range in size from 1/2" to 2". All sizes come complete with an ISO mounting pad (for direct mount actuation) and a lockable lever handle for manual use. BI-TORQ® 3-Way L-Port SS Threaded Ball Valves are not suitable for vacuum service. 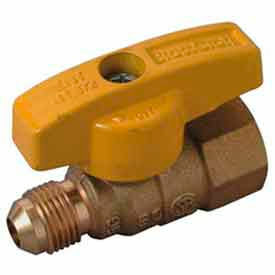 BI-TORQ® 3-Way Manually Operated T-Port SS NPT Threaded Ball Valves Are Heavy Duty Valves For High Cycle Applications. 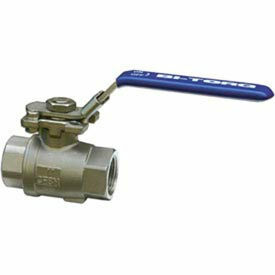 BI-TORQ® 3-Way SS Ball Valves are stainless steel and feature NPT (threaded) ends and a T-Port configuration. Multi-port ball valve with a 4-seat design for high cycle applications. RTFE® seats and TFE® seals ensure valves are compatible with a wide range of industries and media types. Valves have a pressure rating to 1000 PSI and a temperature rating to 400°F. Models range in size from 1/2" to 2". All sizes come complete with an ISO mounting pad (for direct mount actuation) and a lockable lever handle for manual use. BI-TORQ® 3-Way T-Port SS Threaded Ball Valves are not suitable for vacuum service. Brasscraft TBV8 Gas Ball Valve Straight 1/2" F.I.P. x 1/2" F.I.P.